Aurora Expeditions' 120-passenger Greg Mortimer (named after the line's founder) is currently being built in Shanghai, China, and will launch August 2019. 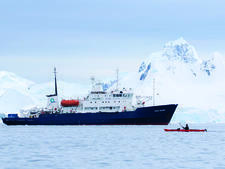 It will join the line's current ship, Polar Pioneer, in offering expedition cruises to Antarctica and the Arctic. The line has an option on a second ship in the same design, but has not confirmed whether it will exercise that option yet. Greg Mortimer marks a few firsts for expedition ships, pioneering a new design and bow shape, called the "X Bow" (or cross bow). This inverts the typical cruise ship design, splitting wave energy and providing faster, more comfortable travel, lower fuel consumption and fewer emissions. It will also debut the first-ever retractable viewing platforms on an expedition cruise ship, which allows passenger to get closer to wildlife. While not the first expedition ship to have "virtual anchoring" capability, Greg Mortimer will also feature dynamic positioning, which uses GPS and high-tech steering to hold position -- thus protecting the polar sea floor from actual anchors. The ship will have 80 cabins across five different categories, including the Captain's Suite, four junior suites, two balcony suites, 59 balcony cabins and 14 outside cabins with a porthole. Other features include a changing room/mud room, Zodiac docks, a restaurant/bar, an observation lounge with floor-to-ceiling windows and a lecture theater. Itineraries include the line's inaugural call at Franz Josef Land, Svalbard and Jan Mayen island, a little-visited Norwegian volcanic island on 2020 itineraries. The ship will also offer the line's first-ever repositioning cruise for passengers, from Antarctica via the west coast of Chile, through the Panama Canal, via the Caribbean then north to Greenland. Greg Mortimer is the line's first purpose-built vessel (though they actually do not own the ship, it's a permanent charter) and marks a step up in terms of quality and design for the line. Its current ship dates from 1982. Built in Finland in 1982 for the Soviet research fleet as Akademik Shuleykin, the 54-passenger ice-strengthened ship is designed for polar cruising.